Observed at Rackensack Canyon, Maricopa Co., Arizona in April 2009. Wingspan is about 4½ cm. 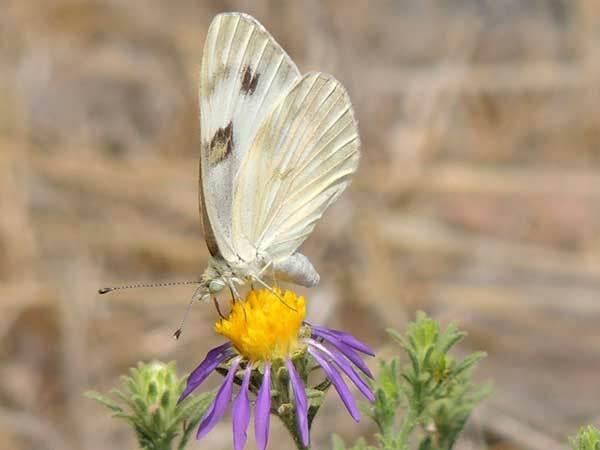 There are several mostly white, mustard-feeding butterflies in the Southwestern United States with the Checkered White being the most common species at middle and lower elevations. They are most abundant in spring from March to May, but may be on the wing any month of the year. Males are more heavily checkered than the females. Occasionally visits flowers. Checkered White is frequent across much of western North America and may have been more widespread in the East before the unintentional introduction of the Cabbage Butterfly (Pieris rapae) from Europe. In the Sonoran Desert the caterpillars (southern cabbage worm) can be found on California Mustard (Guillenia lasiophylla) and Watercress (Nasturtium oficinale) among others. Copyright Michael J. Plagens, page created 21 Aug. 2009.